(I thought a story about hounding rabbits would sit well next to a story about hounding bears.) I started to learn about rabbit hunting after Nancy’s dad introduced me to beagles and Adirondack snowshoe hares on our first Christmas together. Within several weeks I had my first shotgun and a beagle pup, but barely a clue how to bring a brace of bunnies home for dinner. Jupp was a “brace beagle;” he slowly, carefully followed a hare’s track. His tortoise pace, and his use of nose rather than eyes to follow the hare, meant that my hunting buddies never accused him of chasing a rabbit. One of my many rookie mistakes, however, was chasing after Jupp as he was bawling behind a bunny. I learned from experience that rabbits more or less circle from where they were first sniffed out, and that “dog the farthest, rabbit the closest.” So my strategy became a waiting game at the point of first contact. When I heard Jupp far away but just beginning to track back, that’s when I’d finally pump a shell into the Mossberg 500’s chamber and start looking for that tell-tale beady black eye. I think that the beagle may have been engaged in fair chase; I’m pretty sure that beagles and bunnies don’t “understand” what “fair” is, so how can they elect to engage in a fair chase? At any rate, certainly the beagle had no unfair advantages. But is a stationary rabbit hunter also engaged in fair chase? If so, maybe Orion’s Small Game Division needs an alternate phrase to characterize how its hunters honorably engage in their sports’ traditions. Claiming there’s “fair chase” when there is no “chase” may, I fear, offer a cheap opportunity for an anti hunting critique. 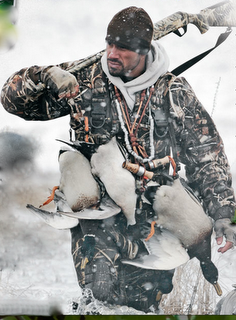 As a hunter, I’d hate to cut the switch for hunting’s critics to whack my own arse with. After I’d hunted bunnies for more than a few years, a new wrinkle to my strategy seemed right. 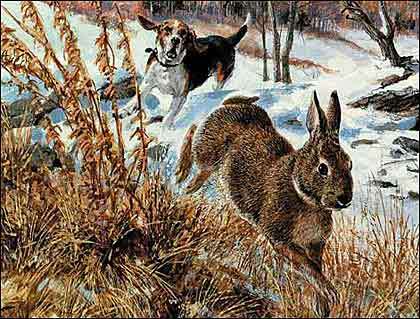 So when a rabbit back tracked the first time, I’d let it scoot by, and hope for a shot on a second, or third, pass. By this time I’d learned that my favorite part of the hunt was listening to “beagle music,” a realization that’s definitely not mine alone. As more time went on, I was shooting at only every third rabbit or so that went by, just, as my father in law taught me, “to keep the dog interested.” Looking back, that’s about as close as you can get to “catch and release” hunting. Would some consider this only-occasionally lethal behavior as wrong headed at best? This is the Humane Society of the United States (HSUS) video about the California hounding bill, California SB 1221. Thoughts, anyone? Is this a fair treatment of the issue?